One of our guest studios: surrounded by bright yellow strawflowers in summer! Giorgio from Italy came to stay.. Inside one of our guest studios: views to the forest, cosy, well insulated...and each with its own modern wood stove. Each building at Sanctuary Australia has been sited and created with the wildlife and landscape in mind, as well as for your comfort. Incorporating recycled, renewable and sustainable materials, all our cabins have open views to the forest. The buildings have been constructed using local labour and materials where possible. The cabins are north-facing, heated with Australian wood-burning stoves and are warm and cosy. Each comfortably sleeps from one, and up four people in shared single bed open accommodation. All guest cabins have an ensuite. Full rain shower bathrooms and attached compost toilets are in our Ganga Bath House. The Ark: once a 12 bay shed, now the hub of the sanctuary after a stylish build and conversion, with a carpeted music and meditation hall, kitchen/dining and a wide verandah for outside dining while the view to the forests. The Ark building holds our expansive carpeted and well heated meditation hall, and adjacent kitchen and dining. The Ark hall is well appointed with a large wood burning stove, audio-visual facilities, presentation area and specially designed Bose music station. Artistic expression is always encouraged at the sanctuary. 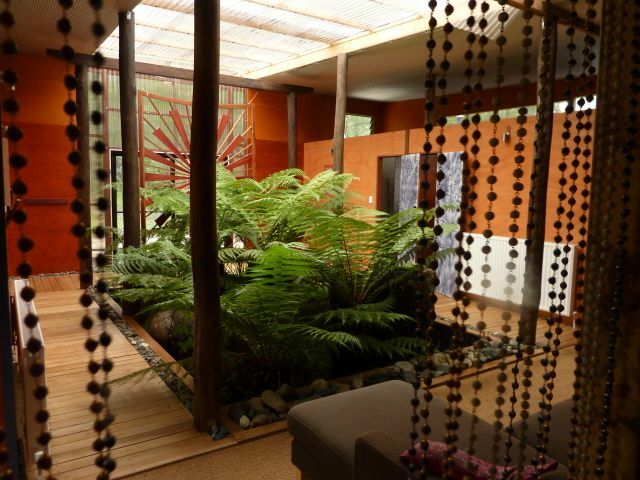 At the sanctuary Ganga Bath House your shower room looks out onto this attractive fern and granite courtyard. The Ganga Bath House contains four self-contained guest shower rooms with rain water showers and state of the art dry compost toilets. The shower rooms have been sensitively built around an internal granite and fern courtyard We have a lounge suite and music for your relaxation, in fact you can program your music for your shower! Our massage chair and infrared sauna are also available for all guests. All electricity is solar generated and we have filtered rain and spring water. Our Japanese bath room is under construction. We are ethical vegans and hand prepare all our food. Most of what we eat is grown in our organic vegetable garden, berry garden and fruit tree orchard. What we can't grow here, we source locally and organically. And our food is supremely delicious! Su Lin from Formosa delights in seeing her first wallaby.. The sanctuary is located on 200 acres of rich and varied forest and bushland. The property includes a huge spring fed natural lake (home to a family of platypi), a long and winding permanent creek, a magnificent rock gorge, forest glades, flood plains...and stunning Earth Art installations for you to discover as you walk along the forest paths. There are six kilometres of well maintained walking pathways ranging from flatlands to the hilly. The walking trails wind through a variety of forest types, including old growth forests, and and rare communities of native trees. The sanctuary is alive with wombats, kangaroos, echidnas, wallabies, platypi, kookaburras, lyre birds and many other species of native birds and animals. Usually the kookaburras and lyrebirds are first up in the morning! We have an abundance of organic fruits and vegetables growing in our gardens and orchards through all seasons. We have two gardens, an orchard and two greenhouses. Most of our food preparation is garden to table, supplemented by purchased biodynamic or organic nuts, legumes and grains. pumpkins galore at the end of summer!